Our review of the Layla mattress, takes a look at this new, updated version of the original Layla mattress that brought many innovations to the mattress industry and was one of the first mattresses on the online mattress market that used copper-infused memory foam and could be customized to different firmness preferences. Layla Sleep was started by two Silicon Valley brothers who grew up in the mattress industry as well as other mattress industry veterans. Layla does a great job at listening to their customers, and has gone over and above to take customer feedback into consideration and has recently improved their mattress, focusing on design, airflow, comfort, cooling, and various health benefits. This in-depth review of the new Layla mattress evaluates all of the criteria we use to determine what constitutes a good mattress, which includes firmness / support, comfort, sleeping hot, and other features as outlined below. The updated Layla mattress is a 10″ memory foam mattress with 4 layers of copper infused memory foam and base support foam. 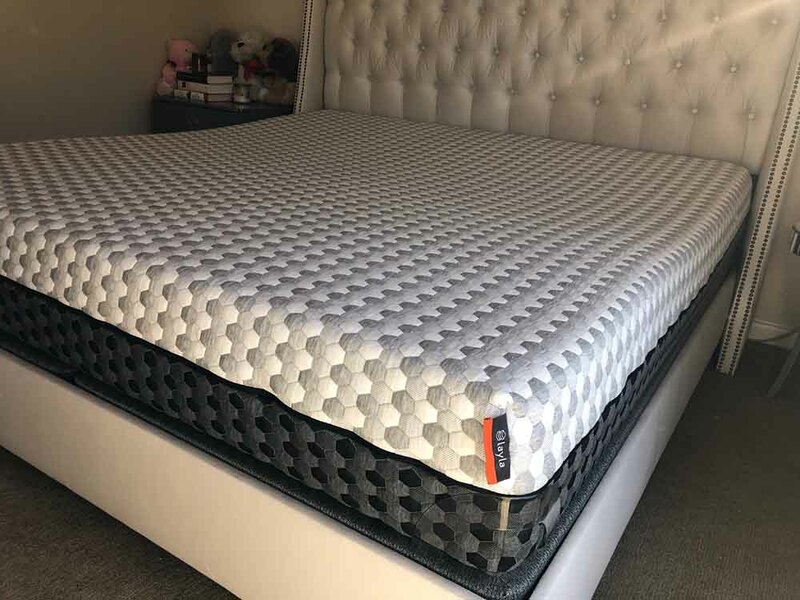 The mattress uses a core inner support foam layer and a comfort layer on each side, and provides the different firmness settings when flipped over. The Layla is the first ever dual sided copper-infused memory foam mattress. Copper is included to help reduce joint inflammation and help ease joint pain and stiffness. The mattress is one of the best for those suffering health conditions that can benefit from a better mattress. This mattress works in the same way like those copper bracelets you see people wearing, by reportedly improving circulation, improving blood flow, and aiding in alleviating health conditions as mentioned above. Copper emits antioxidants and anti-inflammatory properties and provides a lot of health benefits which makes the Layla excellent as a mattress that not only provides great sleep, but helps you heal in the process. 4″ Base Support Foam – 4″ of 2.o ILD Poly Base foam to provide overall support for the mattress in both comfort configurations. 1″ Comfort Layer (Firm setting) – 1″ of the same high density copper infused memory foam as 3″ layer. Layla Sleep designed the Layla mattress with the use of copper, which is proven to increase blood flow and improve circulation. In addition, copper also has cooling properties that the technology in the foam aims to also improve in the mattress. 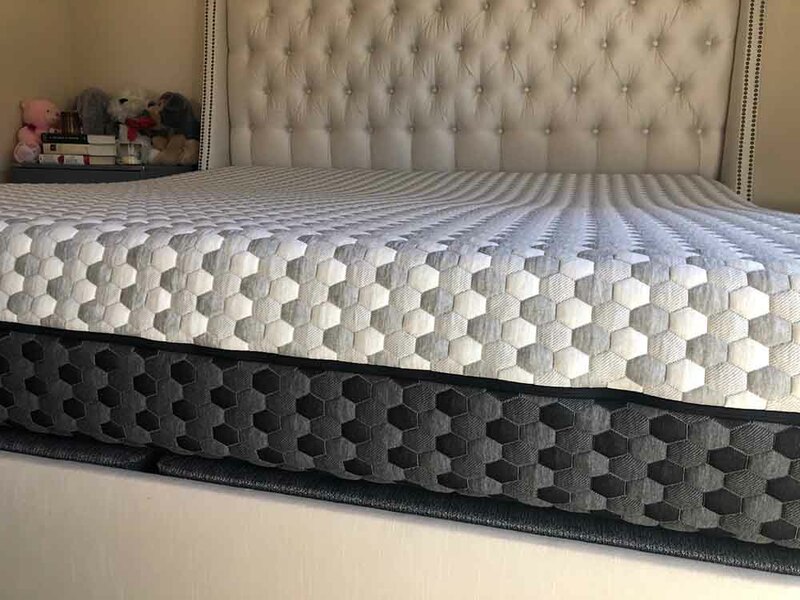 The cover of this new version of the Layla mattress features an interesting and modern design and is specially created to be double sided and allow you to flip the mattress from the soft side to the firm without removing it. They made it in such way which clearly distinguishes which side is soft and which side is firm by labeling each side and making them be of two completely different colors. Like the old cover, this one is also lined with THERMOgel technology that causes the bed to react to your body’s sweat in order to keep you cool at night. In addition, the Layla Sleep is the first mattress company in the world to implement a proprietary softening process to their fabric which makes their covers much softer than any of other sleep products. So, this new, updated cover is incredibly soft and comfortable, and, in conjunction with the copper, it helps the mattress sleep cool and prevents you from waking up hot and sweaty. The new Layla mattress allows you to choose the firmness level simply by flipping the mattress over. You no longer need to unzip the cover in order to adjust the layers and your firmness level, but simply flip the mattress from the soft side to the firm. As we mentioned, the cover is double sided and each side is of a different color, and it not only saves you time in the flipping process but also makes it easier for you to know which side you are sleeping on. The softer side of the Layla mattress is around a 5-6 on a firmness scale (10 being the firmest), while the firmer side offers a much firmer feel and falls around 8 out of 10 (10 being the firmest). The soft side has 3″ of high density copper-infused memory foam and 2″ of convoluted foam above the firm support core made of Poly foam which gives it a softer feel while the firm side has only 1″ of copper-infused memory foam above the firm support layer which makes this side significantly firmer. Personally I like softer mattresses, even though I tend to sink down in them more than most with my heavier weight (230lbs.) The Layla does a great job at supporting both my heavier weight as well as Kaye’s lighter weight, without making us feel “trapped in foam”. In terms of support, the Layla, having two sides, does a good job of providing excellent support in all sleeping positions. Since Kaye and myself are primarily side sleepers, we like mattresses that provide enough give in the top comfort layer to support our shoulders and hips, while also having the firmness if we switch to our stomachs and backs. The soft side of the new Layla is great for this. Back sleepers and stomach sleepers will find the firm side of the Layla good for those styles as well, as it is firm enough to provide support and comfort for those sleeping styles without being too soft and causing excessive sinkage. This mattress can suit all firmness preferences of all types of sleepers, from those that like the softer/medium feel to those wanting the firmer one, simply by flipping the mattress over, which is something that almost all “universal comfort” models can’t accomplish. The Layla mattress is rather comfortable, which was apparent to us upon first lying down on it. As mentioned, its special cover is extremely soft and the all foam construction of this mattress and its soft side really allowed me to sink into the mattress but not feel trapped. As mentioned previously, this really depends on what firmness preference you have, so if you enjoy a softer mattress, the Layla definitely satisfies this on the soft side. Similarly, if you prefer a firmer mattress, just flip it over for a firmer comfort level. We feel that the new updated Layla does an excellent job at appealing to all sleeper preferences and is perfect for all sleeping positions. Sleeping Hot on the Layla? Nope! True to form, the Layla Sleep mattress does deliver when it comes to not sleeping hot, which is a common problem with most memory foam mattresses. The use of copper infused foam definitely works, as we didn’t feel the stickiness that can normally be a result from sleeping on an all foam bed. Have you ever noticed how copper pipes feel cold to the touch? This is a good example of how the mattress helps prevent heat buildup and remain cool when sleeping. The copper naturally helps keep heat away, and in combination with the ThermoGel and open cell memory foam does a great job at keeping the mattress cool at night. The THERMOgel infused cover also contributes to not sweating when sleeping as well. For a heavier sleeper (230 lbs), living in Texas, and sleeping with a partner, this is a HUGE deal. This model does a GREAT job at sleeping much cooler and is head and shoulders above almost every other mattress on the market. Sinkage (and motion transfer) really depends on which side of the new Layla mattress you choose to sleep on. As sinkage is largely weight-dependent, I sunk down a lot more on the softer side. My heavier weight compressed through the top comfort layer foam more than Kaye did, who weights half of what I do. However, this is something I personally enjoy, as I prefer the feeling of my body being contoured in foam which helps support my back and shoulders. This mattress does an excellent job at supporting my heavier weight and not causing Kaye to “roll down into me” because of our weight difference which is one of our pet peeves. On the firm side, this was less of an issue due to the support layer doing most of the work supporting sleeper’s weight. Likewise, edge support is better on the firm side than the soft for the same reason. However, the edge support is very good with the Layla mattress, and I did not compress or sink down to the foundation as I often do with other memory foam mattresses. Motion transfer was excellent (in that it is very minimal) with the new Layla both on the soft side and the firm side. It does great job at at balancing our weight out, which is a huge benefit for couples and something we really look for. This all foam mattress had a minimal amount of smell upon opening the box, which is excellent given its all foam construction and the fact that it comes compressed in a box. A slight off-gassing smell is common with many memory foam mattresses, but the odor with the Layla bed wasn’t so noticeable and did not last very long at all. Any smell that was present dissipated rather quickly. Layla offers some great offerings, which are above what many of the existing bed in the box models offer – primarily the inclusion of the lifetime warranty. As mentioned, the Layla is one of the few mattress companies which offers a lifetime warranty, which will help you feel better about your purchase, knowing that it is supported for the life of the mattress. In addition, one great thing the company does if you choose not to keep the mattress, is that the company will cover the cost to house a homeless person in a city shelter for one night. Their goal is to sell enough mattresses to cover the cost of operation of every shelter in America, year round. An ambitious goal certainly, but one with good intentions. What we also have to mention is that Layla Sleep wanted to reward its customers by improving their unboxing experience. So, we were very surprised when we received a special kit along with the Layla mattress in its new packaging. The kit was filled with various items including the Layla T-shirt, Layla drawstring bag, a plastic wrapper opener, brochures, instructional cards, and stickers. Is a mattress protector needed? Not really with the Layla as it may prevent the temperature regulating material of the Layla from being in contact with your body and helping to dissipate heat. We personally don’t use mattress protectors for this reason. Does it work on adjustable beds? The Layla works great on adjustable beds. We sleep on a Saatva Lineal Base and the Layla does a great job when using it. How easy are returns? Returns are very easy. All you do is call their company and talk to their Sleep Advisors and they will arrange for a local charity to come pick up the mattress, no stuffing it back in the box and trying to ship it back. Easy cheesy. Do they have Financing? Yes, you can get financing through the Affirm company, given a quick credit approval. You can then purchase over time with fixed monthly payments with rates of 10-30% APR. The new Layla mattress is very competitively priced at $899 for a Queen ($799 with our exclusive $100 off coupon). The Layla Sleep took this already popular bed and made it even better and more appealing to a wide variety of sleepers by changing the design of its cover and thus allowing its customers to choose a preferred firmness level simply by flipping the mattress over. The new Layla is an innovative mattress that offers some unique features that other mattresses don’t have these days, including the use of copper as well as a two-sided design that allows choosing the level of firmness. Due to the design and materials, it does sleep cool and depending on your sleep preferences, can go from soft to firm pretty quickly. We feel that the Layla is capable of meeting the needs all sleepers. 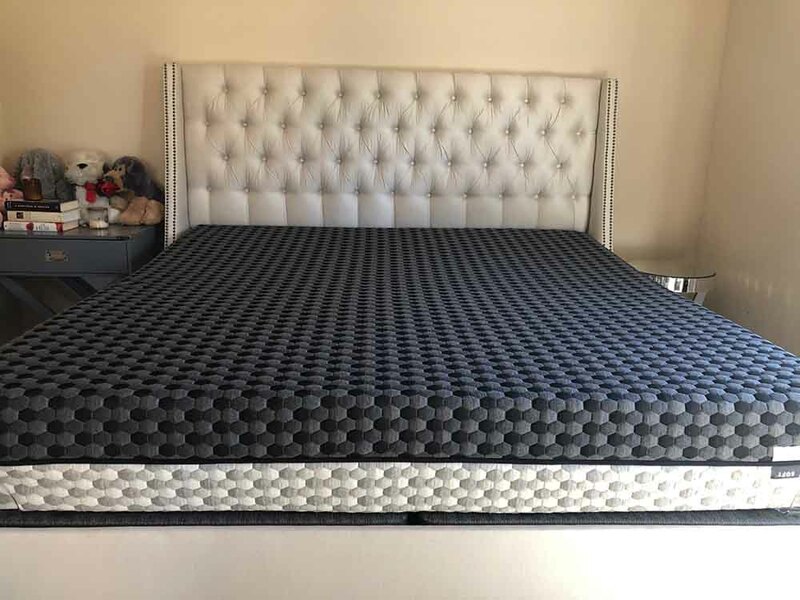 We are very demanding sleepers when it comes to comfort and this new mattress worked perfectly for us as a couple with different weights and firmness preferences. The use of copper does what the company claims and we did feel that the mattress was cooler than most memory foam mattresses in its class. We also did not feel any discomfort and hip or shoulder pain that we often do with many other mattresses. All in all, the new Layla is a well designed and innovative mattress for those that want more than the standard universal comfort type mattresses can offer. We were so impressed by the updates Layla made to their mattress, that we have ranked it our #3 mattress in our “Top 10 Best Mattresses” Guide. We hope our Layla mattress review helps you make a decision during your next mattress purchase! The Layla Sleep mattress sounds perfect for a good night’s sleep. i love the fact that you can flip it to switch from soft to firm! This is the mattress that I need for my joint pain. We like it better than those. It is a pure memory foam feel, with the added benefit of copper and with dual firmness. Ghostbed is firmer and has that “Sleeping on top of ” feel – not so much memory foam and cradling.. and Purple is not impressive at all – very strange material, and not real comfortable and only 9″. Layla is much better than both i our opinion..
I’ve heard of flippable mattresses, but what a bonus to have an option for firmness by flipping! Great idea! Confused about unzipping before flipping it over. And also, if you do flip it, are you losing the cooling properties of the copper? So you have to unzip the cover, then flip over the entire bed.. so that puts the base side closer to your body than the upper side.. so yes, you lose some of the cooling properties of the copper-infused memory foam by having it not next to your body. Its basically having the firmer support side next to your body instead. That’s part of the trade-off for having the firmer side next to your body. Having the choice of a Firm or a Soft mattress is a major selling feature to me. Great review, and definitely a bed that I will consider as I am furnishing my new house. Wow, this sounds like a dream come true mattress! Just to think that this mattress can help me not to wake up with joint pain and stiffness is unbelievable! Wow, it’s duel sided too! I would look forward to getting to bed every night! My mattress is so old that I don’t even remember getting it anymore!! Thanks for the detailed review and fingers crossed that i have this mattress and start sleeping and feeling great! I love that it has copper infused in it. Both hubby and I suffer from joint pain and it would be wonderful to wake up in the morning without it. This review will give you more insight into the specific characteristics of both mattresses and help you realize which one would best meet your personal needs and sleep preferences. Read the full Layla vs. Leesa review. Are you thinking of getting rid of your old innerspring bed to make room for a new all foam mattress? All foam mattresses are known for providing deep compression support, contour and hug to the body, relieving pain and pressure points, and isolating motion transfer. They receive high ratings from consumers when compared to traditional innerspring mattresses, which means that there is a good chance you’ll be totally satisfied with your new bed. Today, we’ll be comparing two all foam mattresses – Layla and Nectar, and one of them may prove to be the right choice for you. Are you looking for a high-quality mattress that will deliver extraordinary comfort and last for years? Have you considered purchasing some of the well-known all foam mattresses such as Layla and Nolah? In this comparison, we take a look at both in our Layla vs Nolah mattress comparison. These are popular and unique mattress brands. They both bring several innovations to mattress industry and while one features special copper-infused memory foam for additional cooling, the other uses its own proprietary Air Foam, but which one is better. Read the full Layla vs. Nolah Comparison! Click here for more Layla mattress comparisons.